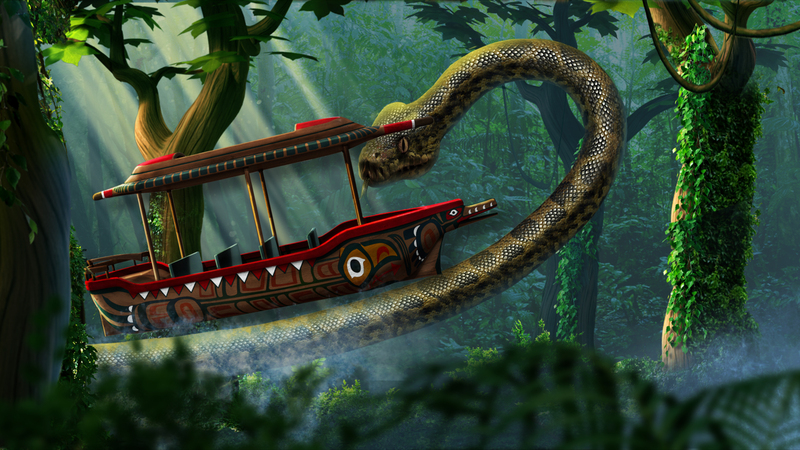 CAVU’s ride dark ride set in water system is designed to carry 12 passengers, making it a perfect family ride. Rather than a standard water trough where the boat simply travels down the water path, this dynamic trough combines the fun of floating with various elements allowing the boat to thrust forward and reverse, rotate, heave up, tilt forward, or even slide sideways via different conveyor belt systems and trough switches. The ride system is designed to be operated indoors, using a trough path moving between various media-based and animatic scenes. The effects are amplified with the use of off-board elements such as wind, mist, heat and scent, as well as water-based effects such as rapids, waves, waterfalls, whirlpools, underwater projection, geysers, and water tunnels.